No matter if you’re packing your clothes for holidays or planning to move to another place, everything should be done the best way so that you wouldn’t find your entire garment wrinkled when unpacking. But how to pack clothes without wrinkles? Have a look at our tips below. Flight attendants say that rolling does not only save space in a suitcase but also helps to avoid wrinkles. In order to pack clothes without wrinkles, you can easily roll the soft fabrics of T-Shirts and cotton pants, and place them in the base of your bag, suitcase or box. When you fold tops and shirts, it is better to fold the body in half, and then roll the items. The rolled pieces should be packed as tight as possible. 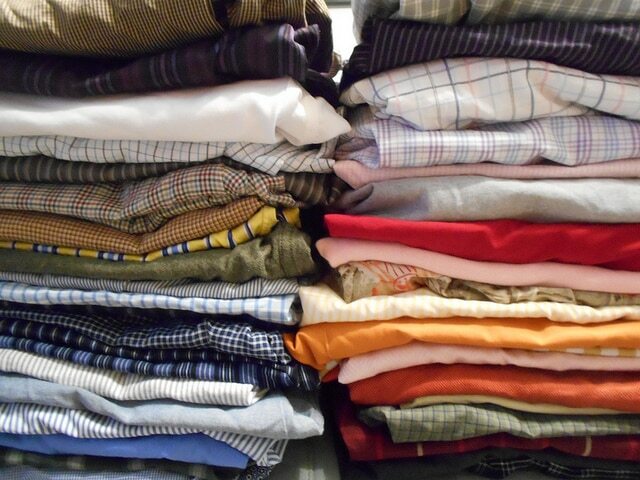 If you’re not sure what to choose, rolling or folding, roll one stack of clothing, and fold another one. Compare the two stacks. Which one looks better? What also matters in the number of wrinkles is the fabric type and the time during which your clothing is going to be packed. However, some people say that a better way of packing clothes is folding. You’d better use some tissue paper or plastic dry cleaners bags to prevent wrinkling. How to fold a dress shirt without wrinkles? To begin with, fully buttoning the shirt will provide a wrinkle-free fold. Put the shirt face down, spread it out, and then fold the sleeves horizontally. Make sure that the sides of your shirt don’t fold over. Fold in the sides to the middle of the shirt making a little V at the top. This means you’re doing everything right. Then, fold it in half, lengthwise. You can even fold it up for a tighter fold. Answering the question “How to pack clothes without wrinkles?” we should say that the bundle wrapping technique ensures fewer wrinkles. Besides, it will save you some room in the luggage or box. This method will take a bit more effort than folding and rolling, but the result is totally worth it. Making a soft central core and firmly wrapping your clothes layer by layer. The tension of fabrics reduces the wrinkles as there’re fewer folds that can cause them. As for the size of the core, it depends on the size of your clothes and their amount, but something around 11 × 16″ (30 × 40cm) will generally work well. Pack your clothing in a particular order, so that large and heavy pieces would be on the top of the bundle. If you have a jacket, put it on the table or any other working surface first, face down. The next layer will be longer skirts and dresses. Then, lay off your long-sleeve shirts 180 degrees to the jacket, face up, and smooth it out carefully with the arms out. The both collars should be almost at the place where the core will go. Arrange your clothes with shirts on the vertical and pants on the horizontal. The T-shirts should go the last. Finally, wrap the T-shirts around the core, sleeves first, then the body. Since the legs of the pants are completely straight, there will be no wrinkles. Smooth out every piece as you go layer by layer. Choose the best technique for you and enjoy the result when unpacking your clothing at the place of destination. ← How Much Does It Cost To Furnish An Apartment?